Buy prescription glasses online: It's simple, safe and cheap! Producing eyeglasses isn't particularly expensive. Buying them, on the other hand, used to be a costly affair until online opticians such as ExtraOptical came along and shook up established notions of how much prescription glasses must cost. Today, you can find prescription glasses at very low prices — all included! 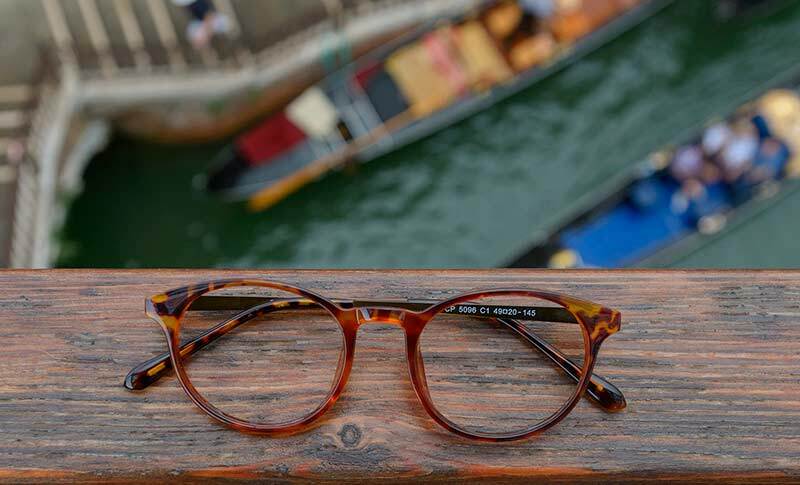 Are you still thinking that cheap eyewear can't have good optical quality? With all due respect: That idea is outdated. The eyeglasses you buy from ExtraOptical are exactly the same quality as those you would get from your high street optician. Lenses and frames come from the same suppliers, and every pair we sell is produced by order, edged, assembled and quality controlled by our skilled optical dispensers in Norway. The difference between ExtraOptical and traditional opticians is simply that we, as an internet-only shop, have very low costs. We spend little or nothing on rent, merchandizing and warehousing — and therefore, so do you. Prescription eyeglasses for every need. Our web shop offers a great selection of eyeglasses of every kind. You'll find ordinary prescription glasses and sunglasses, sports glasses and googles. Of course, we cater to men, women and children alike. We make glasses for all types of vision correction, be it nearsightedness, farsightedness, astigmatism or presbyopia. Do you have a weak spot for trendy, exclusive eyewear? You'll love our wide selection of frames from fashion houses like Calvin Klein, Guess, Oakley and Ray-Ban, to name but a few. Do you care more about prices and less about brands? We have plenty of non-brand quality frames to choose from as well. Cool glasses, cute glasses, retro glasses or modern glasses: Our web shop has something for every taste. But no matter what kind of eyewear you choose, you'll pay less for it than you would elsewhere! How to purchase prescription glasses from Extra Optical? Before you can make a purchase, you'll need a copy of your prescription. Your optician is required by law to provide you with a copy, regardless of where you choose to buy your glasses. When you have your prescription in front of you, go to the web store and choose your frame. We recommend using the filters for shape, price, color, etc. to facilitate the process. The next step is to enter the values from your prescription. On our website, you'll find guidelines to help you understand and interpret the different values, but if you find it difficult, give our customer service a call and we'll help you get your order right. You can also simply send us your prescription by email and let us handle everything. Finally, you can select add-ons such as tinted glasses or anti-reflective coating, before you check out and pay. A few days later, you receive your new prescription glasses by mail. Ready? Go! We look forward to making your glasses!